Where I went and where followers should walk are two separate pathways. I will describe my walk for your amusement, but you should stay on the highway and not deviate as I did. Only a masochist would take my path. 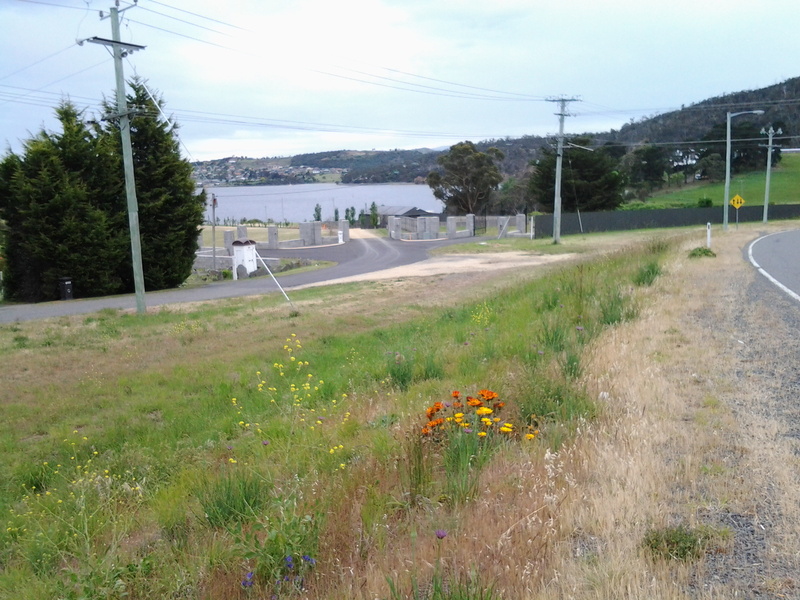 Having connected back onto the East Derwent Highway from Otago Bay Road I continued walking north. 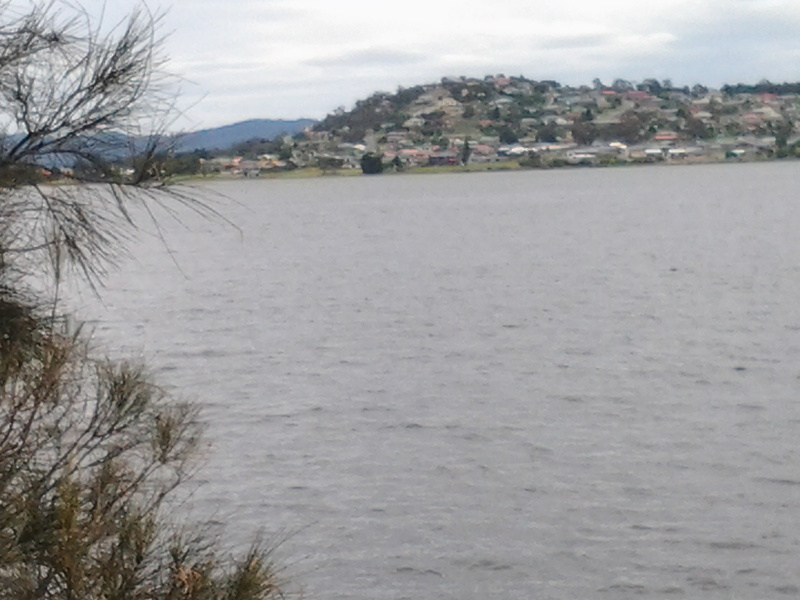 On route I looked north across the Derwent River to the next suburb Old Beach, as shown in the photo below. I loved the yellow/orange/burnt red coloured gazania flowers which grew wildly along many parts of this route. Not long afterwards, I reached Murtons Rd and turned left to walk towards the river edge. To my left was the small inlet Woodville Bay. In the photo of the Bay below, I believe the yellow flowers in the foreground are probably part of wild wind-sown canola plants. This area seemed very rural and I enjoyed the tufts of wild fennel growing near the edge of the road, the green grassy paddocks and the screaming plovers making it clear I was encroaching on their territory. I was delighted when two black lambs raced down their paddock to greet me, obviously hand-reared and very comfortable with humans. 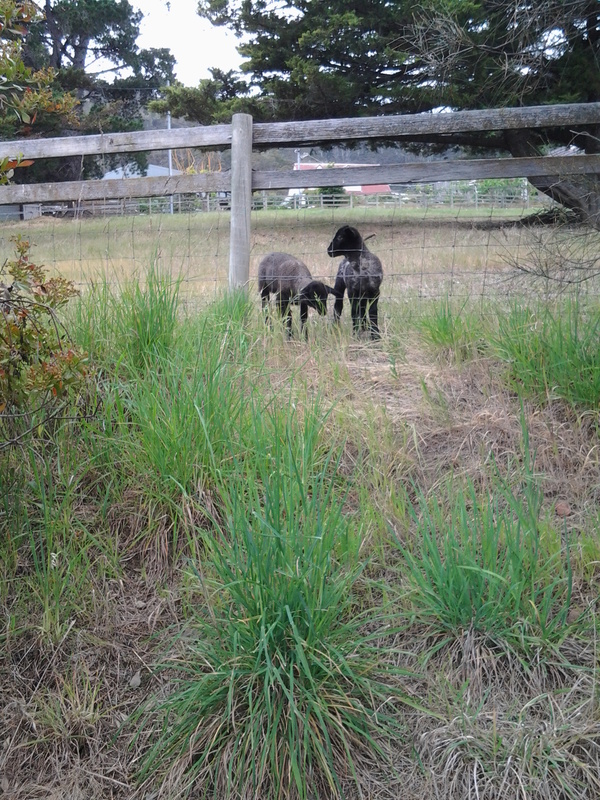 If I had picked them up over the fence it would probably have been a case of ‘Mary had a little lamb … and everywhere that Mary went the lamb was sure to follow’. Very cute. Very vocal. 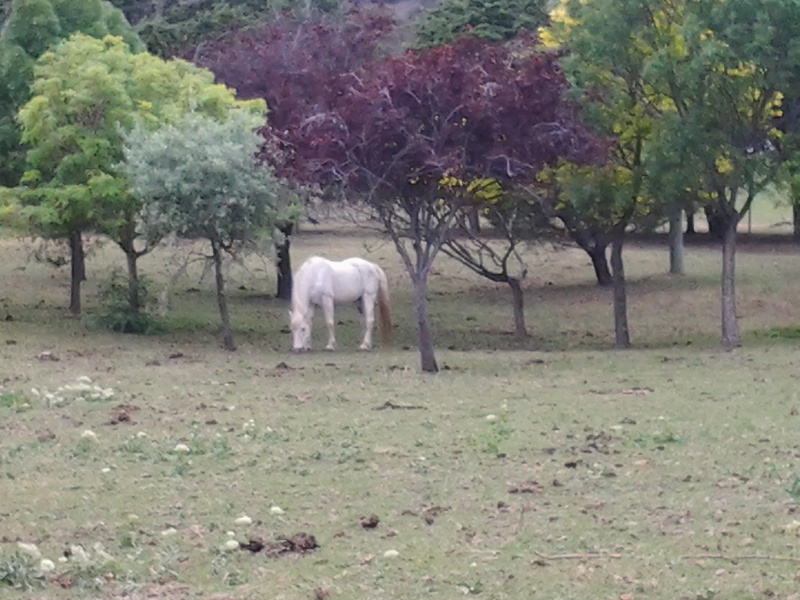 Further on, a couple of rough looking shetland ponies appeared on the hill above and in a later paddock, horses nibbled slim pastures. 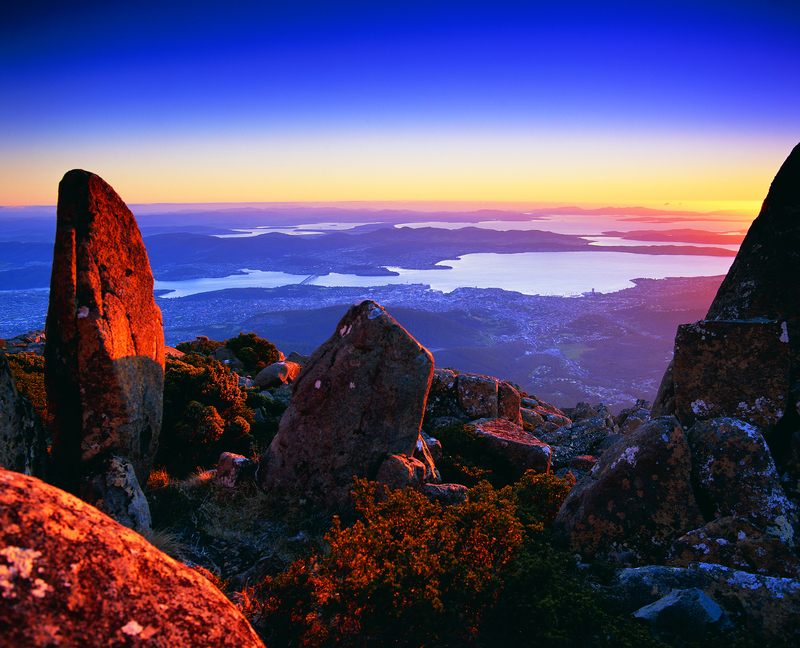 On my left I had clear views across the Derwent River to the suburb of Old Beach. I surprised a pair of native hens scratching in the undergrowth. My arrival disturbed them so they skittered away. 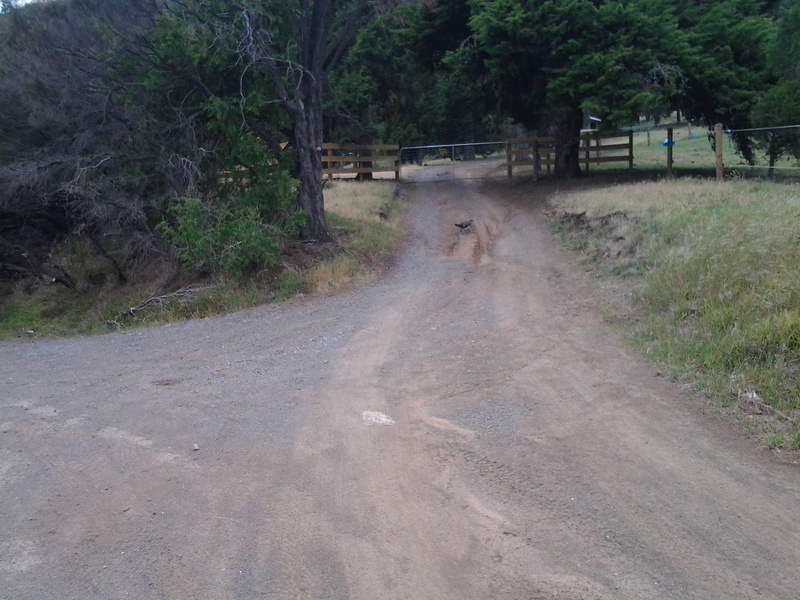 If you look closely in the photo below you will see one running across the roadway leading to a private property. Soon afterwards, the road on which I was walking came to an end. Ahead of me through the bushes was the barely visible remains of pathways that others, and perhaps animals, had walked very occasionally. I had the choice to step down onto the narrow easy rocky shore or work my way through these paths which were only a little above water level. You may recall from an earlier blog, that friend Me and I did some advance research on the possibilities for my future walks. This was one cul de sac we reached. Back then the paths were much clearer. In the few weeks since we investigated, spring rains and rising temperatures have encouraged the plant life to flourish. I was fine clambering over and under fallen trees and branches and avoiding abandoned car tyres and other rubbish, but then the track disappeared under a thicket. Not to be beaten, and never to retreat, I decided to drop down onto the rocks and continue walking along the foreshore. Around one corner I was surprised to find a pair of duck parents and their totally camouflaged teenager sleeping on the rocks amidst the flotsam and jetsam of human kind. Their retreat to the water was slow and cumbersome. It was almost as if a human being had never passed this way before. This was okay for a while until I met with a barrier of tree branches cascading into and across the water. I realised there would be no easy way over or through. Spotting the makings of a rough pathway on the bank, I clambered up. Before long I was practising something like one does with that ‘pick up sticks’ children’s game: I was lifting one spiky branch and pieces of barbed wire off another and standing on others in order to move my way through an ever more tricky brambling landscape. Vaguely in the distance, through the vegetation, I could glimpse a hill which looked like soft grass. A very attractive vista considering my circumstances. Between me and that escape route was a tangle of wild freely sown long waving branches of thorny roses, and a forest of healthy but spiky blackberry canes, all intertwined. Going back to Murtons Road was not an option I would consider. So, rather like a snorting pig, and sometimes down on my knees, I edged my way through. It took quite a while. Surprisingly no clothes were ripped and I received only a few slight scratches. Climbing the small hill of weedy and native grasses was comparatively heavenly by comparison. Then I found myself back on the East Derwent Highway and strode off happily a few minutes after 12 noon. 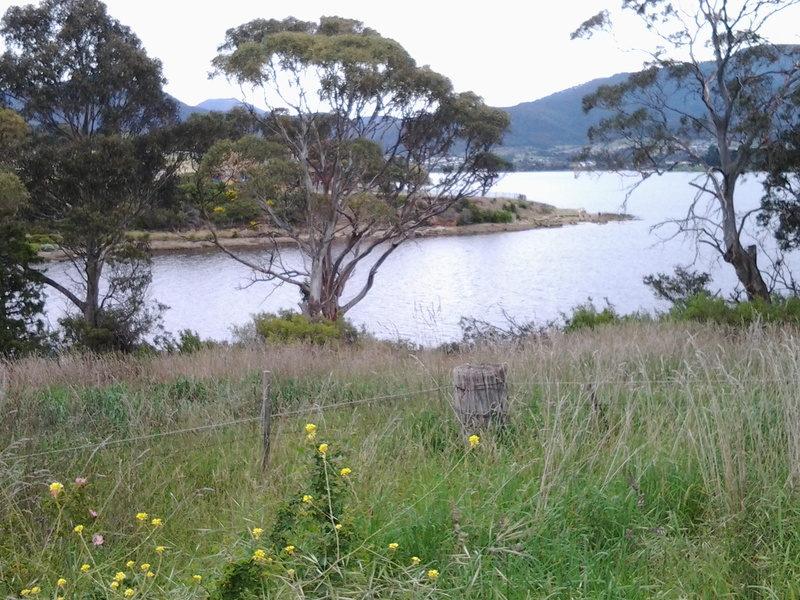 This entry was posted in Derwent River, Walking and tagged East Derwent Highway, Murtons Road, native hens, Old Beach, Otago Bay Road, Woodville Bay on November 6, 2014 by Tasmanian traveller.